Half the battle of home repair and maintenance is figuring out when it’ time to roll up your sleeves and do some fixing. A leaky roof makes itself known in unmistakable ways, but it’s not as easy to tell when to replace tub and shower parts. Unfortunately, undetected problems are costly and waste a significant amount of water. The most obvious sign of a problem is a leak or drippy faucet. In addition to being highly annoying, these are often red flags that at least one part is in need of replacement. Don’t panic! This doesn’t call for a full renovation unless you want it to. Switching out old, inefficient parts for modern, green shower parts makes sense if you have the time and inclination. Plumbing pipes are bound to wear out over the years. Often, once the source of a leak is found, you can repair it by simply replacing the degraded part rather than installing a whole new unit. Sometimes the pipes are fine and all you need to do is change washers or seals. Assessing a plumbing issue may be out of your DIY comfort zone, but maybe not. If you want to inspect the problem yourself before calling a plumber, start by placing your finger under the drip. If the temperature of the water is cold, the source is likely the cold water handle and vice versa for warm drips. Make sure to shut off the water before taking a look at the interior parts! Just about every major purchase and maintenance project comes with reasonably accurate expected life spans. 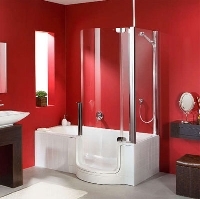 While you can find a new bathtub at an affordable price, the total cost of removing the old one and installing a new one is much higher because bathrooms are built around the original bathtub. The question of whether to replace tub and shower parts typically results in refinishing the tub and investing in high quality parts. Refinishing a standard tub typically costs around $400 and, when done well, will last for about 15 years. The money and resources saved by refinishing allows you to invest in a new shower head, spouts and other components that’ll last as long. The best time to replace tub and shower parts is when there’s a problem that demands attention. While you’re switching out an old pipe or broken head, you may as well change out the diverter spouts if it’s something you’ve been meaning to do anyway. The most proactive DIYers tend put off bathroom improvements, so it’s best to do as much as you can while you’re there. Save water! New components offer good water pressure while using up to 40% less water as traditional heads. This saves money, resources and contributes to a more sustainable lifestyle. Shop when the price is right. Bathroom renovations can be pricey when you’re working on a tight time frame. Prepare ahead of time by purchasing new parts when merchants have sales, and when it’s time to do the project basic materials and labor will be your only additional costs. When you don’t like the way it looks. While looks aren’t everything, adding beauty to a bathroom turns an otherwise utilitarian space into a relaxing retreat. Replacing old spouts and handles with attractive ones has a powerful impact on the overall look and feel of the space. Taking a shower or bath is a highlight of the day for many people. This space deserves a little extra attention.